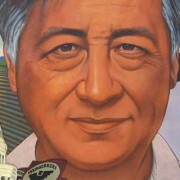 FRESNO — As buzz mounts for the film “Cesar Chavez” that opens in 100 cities nationwide this week, Fresno State will hold its 18th annual Cesar E. Chavez Celebration and Garlanding Ceremony from 11 a.m.-1:30 p.m. Wednesday at the Peace Garden monument that memorializes the late farmworker leader. The guest speaker will be Mary Castro, the wife of University President Joseph I. Castro. Fresno State’s first lady, whose father milked cows on a dairy farm in Laton for 40-plus years, brings a lifetime of Valley agriculture experiences to the event. She will speak at about 12:30 p.m. The observance is part of National Farmworker Awareness Week, when students and community members raise awareness about farmworker issues on college campuses and in their communities. Campus will be closed Monday, March 31, Chavez’s birthday, in observance of Cesar Chavez Day of Service and Learning, a state holiday. “Our Cesar E. Chavez Celebration and Garlanding Ceremony helps spotlight farmworker conditions and honors farmworkers’ important contributions to us every day,” said student Fabiola Ramirez, a member of the celebration planning committee made up of employees, student organizations and other support programs at Fresno State. “This isn’t just entertainment, it is educational for people who want to know who Cesar Chavez was and the meaningful legacy he left us,” said Ramírez, a sophomore Mass Communication and Journalism major from Atwater whose parents are farmworkers. The Cesar Chavez Exhibit is on display on the first and second floors of the Henry Madden Library as well as in the University Student Union. An altar will be set up at Wednesday’s free, public event to honor Chavez. Various student and community organizations will have informational booths. Fresno State’s Los Danzantes de Aztlán, folkloric student dancers in the Chicano and Latin and American Studies department, will perform at 11:45 a.m. followed at noon with welcomes by Daniela Flores, chair of the planning committee, and Raul Moreno, coordinator of University Migrant Services. Presentation of flags from the U.S., Mexico and the United Farm Workers and performances of the national anthems of the two countries precede Castro’s talk. Two student organizations, TORTILLA (Teatro of Raza Towards Involvement in Local Latino Awareness) and Trabajadores de la Raza, will present “The Declamations — Prayer for the Farmworkers’ Struggle” in Spanish and English. Professor Phil Gonzalez’s Chicano and Latin American Studies class will also do a presentation. The garlanding ceremony will be at 12:45 p.m., led by Dr. Sudarshan Kapoor, professor emeritus of Social Work, who founded the Peace Garden in 1990. He’ll be followed by the presentation of carnations, in which the public may participate by laying carnations at the base of the monument. The Fresno State Mariachi will perform “De Colores” (The Colors), which was an anthem of the farmworkers movement since its early days with the five-year Delano Grape Strike launched in1965 by the Agricultural Workers Organizing Committee and the National Farmworkers Association. The two organizations merged to become the United Farm Workers union. Chavez served as president until his death on April 23, 1993. His final resting place is at La Paz in Kern County, the UFW’s California headquarters. Last week, UFW co-founder Dolores Huerta visited campus and spoke at a sociology class about the American Healthcare Act and delivered the keynote address at the Latina Leadership Conference. In 2011, she was the keynote speaker at Fresno State’s Chavez celebration with the late Richard Chavez, Cesar’s brother, who died a few months later. Richard created the iconic UFW eagle that will be featured in small flags throughout the Peace Garden. The “Cesar Chavez” film by actor-director Diego Luna stars Michael Peña (as Chavez) and Rosario Dawson and America Ferrera. The film tells the story of the farmworker leader and includes references to Fresno’s role in the struggle. The United Farm Workers and the UFW Foundation are sponsoring a special event Sunday, March 30 with a screening at 5 p.m., a panel discussion following at Edwards Fresno Stadium 22 Cinemas in River Park (250 E Paseo Del Centro) and the Fundraising VIP Red Carpet Cocktail Reception at 7 p.m. at Ruth’s Chris Steak House (7844 North Blackstone Ave.). A limited number of special rate tickets for students with current ID are available for the Red Carpet fundraiser by calling 559.496.0700. For more information about Fresno State’s celebration, contact Moreno at 559.278.5750 or raulm@csufresno.edu or Ramírez atframirez28@mail.fresnostate.edu.